I took this about a month or so ago from Commenter Breezeway's property. It's been a busy weekend here in Chesapeake Bay Land. One of the highlights was Big Hair Envy's Friday visit which included stops at the public beach, Gwynn's Island and Sandpiper Reef's screened porch. We spent two minutes some time reviewing details and logistics for the upcoming Blog Fest, and she left with her pockets full of broken beer bottles sea glass. Friday evening, Chesapeake Bay Daughter was retrieving something from underneath a pine tree and a black snake dropped out of the tree right on the ground in front of her. Saturday afternoon, it was back to Sandpiper again for Anonymous Hallieford Resident's Daughter's graduation celebration, which included steamed crabs on the screened porch. Baby Sister and Friend, who said they'd be here before noon, arrived 2 hours late. As soon as her feet crossed the threshold, Baby Sis slathered on six coats of lipstick and three coats of lip gloss, then proceeded to leave lipstick marks all over my glassware. Her Friend cooked supper so I overlooked the inconvenience of needing a power washer to clean the glasses. Chesapeake Bay Children thoroughly enjoyed their visit with Auntie Baby Sis. Tell me what you did if you feel like it. If you don't feel like it, then see if you can say this five consecutive times, really fast: "steamed crabs on the screened porch." And now, thankfully, comes the silent part of Silent Sunday. OK, to be clear, none of the above is sea glass, however we did find the items in the surrounding waters. On the left is an arrowhead (aka projectile point) Chesapeake Bay Daughter found on Aaron's Beach. The glass in the middle we found in the Rappahannock River and the blue bottle was around our shoreline. Double click on the photo to enlarge the image for a better view. We do have way too much some sea glass that I'll photograph as soon as I figure out how to make a mountain of broken glass look artistic soon. Chesapeake Bay Daughter has written the following piece regarding her mother's latest obsession fascination. Of course, at first all we see is junk brown sea glass. CBW is very picky says she only wants green, blue or purple (if it exists). Turns out purple is not part of CBW's imagination it is in fact a color of some sea glass. After 300 years a while we went home. Hallelujah. P.S. We were successful and found lots of sea glass. P.P.S. I have to admit it was kinda fun. Truth be told, CB Daughter loves looking for sea glass as much as I do. Ever since she found that arrowhead I am obsessed with bound and determined to find one myself. p.s. C.B. Daughter is my favorite girl ever, and she really makes me laugh. p.p.s C.B. Daughter inserted all those strike-throughs herself. p.p.s.s. We do a lot of laughing around the Chesapeake Bay household. A lot. This is a picture of the killer rosebush that--any day now--will overtake the house and poke us to death with her thorns. This plant has some sort of thyroid problem--gigantism, maybe?--that has caused it to grow out of control. Speaking of out of control, welcome to another edition of Chesapeake Bay Woman's Guide to Home Improvement. Today we're going to learn how to properly secure your daughter's bulletin board to her bedroom wall. Warning: Do not try this at home unless you're crazy loco trained in the proper use of hand tools and/or have taken at least one extra large Valium. 1. When Daughter says she wants a bulletin board, buy her one. Place it on her desk and leave it there unopened for one whole year so that every time you walk into her room you're reminded of yet another project that needs doing. 2. Discuss where your daughter would like the bulletin board hung. Then disregard what she says and select what you think is the best spot, which is next to the door and just above the light switch. 3. Remove plastic wrap and curse under your breath when you notice it's made by Rose Art. Welcome to the trap known as Rose Art, where they lure you with cheap prices and then turn you into a stark raving maniac when whatever the product is doesn't work or breaks or both. Feel heat creeping up your neck like a vine. 4. Briefly scan the instructions and notice there is some talk about drywall screws being enclosed, and also you will need a drill. Feel that vine of heat start to tighten its grip on your throat as it races right up your neck to envelop your head. 5. Tell Chesapeake Bay Daughter you'll be right back after you get a hammer since you don't own a drill. 6. Commence to hammering the drywall screw into the wall. As with all Chesapeake Bay Woman home projects, be sure all your critical paperwork is in order lest something should happen, such as going blind from drywall and paint chips which drop into your eyes as you hammer a fastener that is supposed to be drilled. Feel a bead of sweat--or twenty--sprout from your forehead. 7. Continue to mercilessly hammer the plastic drywall screw until it breaks and/or there's a gaping hole in the wall. Feel the steam bursting from your ears like a boiling teapot inside a pressure cooker. 8. Tell Daughter there is a reason you don't do this stuff, namely that, quite frankly, you do not possess the skills or patience to hang a bulletin board and can provide no earthly reason why you thought you ever could do it. Say this through gritted teeth and notice the awkward silence when Daughter does not respond because one false move and she knows what happens next: mushroom cloud forms over house. 9. Drop the hammer and get some nails. Take a pencil and mark off where the nails should be hammered, except don't measure anything, just look at the bulletin board, look at the wall and make some marks on it with the pencil. Do not use a level or anything. This only takes away from the surprise of the finished product. 10. Try to hang the bulletin board on the thumb-tack sized nails you retrieved. Actually, they're so small they may well be brads. When bulletin board will not adhere to wall, drop hammer on the floor (barely missing feet) and stomp downstairs, mumbling the whole while that you cannot do it and will have to call CB Father to come do it. Mop sweat off brow. 11. Notice the eerie silence coming from CB Daughter's section of the room as she processes the scene unfolding. Actually, CB Daughter knows exactly what is going on because she has seen this scene unfold on a daily basis far too often whenever CBW attempts to complete anything a project. 12. Oversee a knock-down, drag-out fight between the CBW who cannot complete the project and the CBW who refuses to give up in spite of her incompetence. 13. Tromp back upstairs, pick up hammer, and take frustrations out on wall, nails, bulletin board and hammer as rivers of sweat pour down your neck and back. 13. Voila! The bulletin board is somehow magically affixed to the wall. Ignore the fact that it's crooked and appears to be covering a corner of the light switch. 14. Apologize to Daughter for ugly display; laugh with her when she finally starts laughing at you. Peel off sweaty clothes saturated with a heavy dose of animosity towards bulletin boards, hammers, drywall screws, instruction booklets and all most projects relating to the home. 15. Notice the broom/mop holder you recently purchased to hang inside the door of the broom closet. See on the package that it says a drill is required. Hardware is included. Feel the heat begin to climb up your neck again. But then take a deep breath and relax. 16. You just bought it. It needs to sit there for at least another year. Disclaimer: No children, psyches or toes were harmed in the hanging of this bulletin board. However, be advised that should that bulletin board ever fall down--for example, in about two days--there will be several large holes in that drywall that will need fixing. Welcome to yet another edition of Three Ring Thing Thursday, where I tell you three random things (a limit of three is necessary for me, otherwise these posts would stretch from here to Buenos Aires and back with a few incidental side trips to Indonesia), and you tell me three random things--for which I am eternally grateful because your comments are the best. Three Thing Ring Thursday is slowly but surely becoming my favorite day of the week, right after Friday night, Saturday morning, any and all paid holidays, snow days, sick days and the day I win the lottery. Let's run away screaming dive right in, shall we? 1. With each day that passes I become more of a hypochondriac. Perhaps this is due to stress mental illness the fact that more and more people my age or younger are having horrible things happen to them. Perhaps it's simply stress mental illness my obsession with reading the obituaries every day and an overall fear of dying before really enjoying life to the fullest (and seeing Bora Bora from an over-water thatched hut). But right now if you asked what was wrong, I'd swear I had leukemia, anemia, stomach cancer, heart disease or alzheimers Alzheimers. Any combination of the aforementioned is possible too. I'm bruising to beat the band--spontaneous bruises. It's leukemia or anemia, I'm convinced. Of course there's always the thyroid. But don't get me started on that. 2. The Chesapeake Bay Children's last full day of classes is today, although school is still in session until Tuesday. I am off from the paying job effective tonight through Monday, June 8, so that I can spend quality time blogging and teaching my daughter how to blog with my children who I feel I never get to see any more. They're growing like weeds; I work too much too much and time is flying by. Now it's your turn to tell me three random things. Anything you want, don't even feel limited to three. *Dearest Baby Sis: Although it may seem like it, I was not comparing you to an unwanted facial hair. Rather, the point was it's very difficult to predict when you will show up. Given that the Chesapeake Bay Children and your parents will be asking ME every two seconds when you will arrive, perhaps you could give us a range, say "between Friday and Sunday" and then perhaps another range "between the time I get up and the time I go to sleep" so that we can better anticipate your arrival. Love and Laughter, Big Sis. Warning: Staring directly into the sun's glare may burn a hole in your retina. Please wear protective eye gear such as a blind fold when viewing this photo. Thank you. Once upon a time there was a slightly off-kilter bored under-utilized employee named Chesapeake Bay Woman. 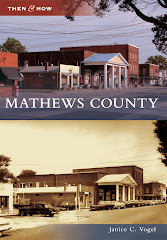 One day as she was reading a magazine perusing research material, she came across some very interesting facts about Mathews and the surrounding areas. By the way, Chesapeake Bay Woman has enough blog fodder for two new blogs in addition to Life in Mathews: one for work and the other one for personal drama, but let's get back to the story pertaining to this blog post, already in progress, which has to do with facts and figures, although how would you know since I've not told you anything thus far that wasn't off on a tangent? Now, before Chesapeake Bay Woman's circuitry overloads and all systems shut down, she'd like to make a few analytical statements, which is about all she's good for in any year--a few. 1. The houses are worth more in Mathews. 2. There are fewer people in Mathews, and we have an older population than Gloucester, but not as old as Middlesex. 3. There are four times as many people in Gloucester as in Mathews. 4. All of them go to the Gloucester Wal-Mart at the same time. And they all check out at the same time, which is exactly when Wal-Mart decides that it needs to send all its cashiers on break except the one 15-year-old who doesn't know what cilantro is or the elderly lady who wants to talk to you about her bunions, her chihuahuas and her hairdresser's boyfriend's cousin's twelve cats, one of which had kittens and kept her up all night. If you ever want to see a freak show, try sitting down on a bench inside that Gloucester Wal-Mart. Then you might understand why the Chesapeake Bay Family calls it Wal-Mutant. Disclaimer: The author of this blog post does not claim to be any better than anyone from Gloucester, Middlesex or surrounding counties, nor does she claim to be bunion-free. Although she feels it is exceedingly important that everyone become well-acquainted with cilantro, she understands that not everyone is. She does, however, feel very strongly that something is going on in that Gloucester Wal-Mart because she's never seen anything like it and wonders if it isn't some parallel universe unaccounted for on those population stats above. The other morning--the very same misty morning which produced the previous two posts' pictures--I walked over to my parents' dock to avoid vacuuming look down the creek. The sheer number of photographicable (it's a word, just play along) scenes were staggering. Balancing myself after all the reeling, I briefly glanced backwards and saw this along the shoreline. What words, thoughts, phrases or sentences does this picture generate? CBW, who ordinarily could write ten thousand words on any random this topic, is tired and will merely offer a few completely unimaginative and uninspired remarks. 2. Those bricks have been there for eons. 3. Reflections can be prettier than the images they mimic, but only if they are true. 4. Those bricks and the random concrete slab on the left were tossed out around the 1950's when my grandparents first moved into the house. In those days, shorelines were considered dumping grounds for anything that they couldn't burn solid such as bricks, glass, etc. 5. The best image is the one which is true, the same inside and out; above and below water. Tell me what you see, and remember there is never a wrong answer here at Eastern State Hospital Crazyville Life in Mathews. This is another shot from the same misty/foggy/eerie/creepy/Scooby Doo Morning as yesterday's photo, except this time the centerpiece is the sun's reflection in the creek right in line with the glow on the horizon. That fog and haze just at the tree line is from Mother Nature, not from Photo Shop or any other special effect program which Chesapeake Bay Woman wouldn't know how to use even if she were born with the instruction booklet tattooed on the back of her hand. One more time: Happy Memorial Day. Believe it or not, this is a recent sunrise on Queen's Creek. Believe it or not, Chesapeake Bay Woman did not use any special effects other than the "auto" setting on her camera. There was a lot of mist, fog and cloud cover this particular day. Take a look at that ball of sun in between the two pine branches. Then look at the glow on the horizon. Then give me one good reason why I should live anywhere else. Have a peaceful Sunday, as calm and smooth as this creek. Pictured, left to right: Middle Sister, Chesapeake Bay Girl. Also pictured, left to right: Middle Sister so stubborn and head strong that mules contact her for lessons in Obstinate; Older Sister, always the one responsible for the well-being of younger siblings. Rinse and repeat until Middle Sister is crying. Chesapeake Bay Mother doesn't know or care who started what but when the screaming and fighting escalate to a certain decibel level, she marches towards the kitchen for the fly swatter. Chesapeake Bay Girl--as usual--is blamed for Middle Sister's behavior. p.s. And they wonder why I served D-con rat poison at a tea party or fed the younger sisters under-cooked sausage. OK. You don't have to tell me. I already know this is an awful picture. This morning I went over to my parents' house to take a picture of what my father gave to my mother on Mother's Day. The particular item was garaged in their barn in a most unphotogenic location. From a distance, the barn is very photogenic. Up close...well I don't want to talk about it. Yes, that's a screen door propped up on the left wall. No, I have no idea what that other junk is. Yes, we have an inability to throw anything away clutter. Chesapeake Bay Mother has written a thank you note to CB Father for the touching, well-thought-out gift he presented her for Mother's Day. We have a new addition to the family--a new Cub Cadet, well-appointed with headlights, beverage holders, and arm rests. Precision trained and not the sort of lawn equipment to turn on its owners*, we have high hopes for a long and happy working relationship. Husband informs me on Mother's Day that it is one half of my Mother's Day present; the other half being the two bar stools I specifically requested for Mother's Day to complement my new kitchen bar. Somewhere along the line the words "bar stool" and "Cub Cadet" in the same thought sequence obfuscate down in Husband's mind to a spanking new Cub Cadet full of sound and fury and nary a concern in the world for what I wanted, asked for and was eagerly anticipating--two (2) bar stools. When I asked about them, he said Home Depot was all out of them and every mother should be so lucky to have such a lawn mower. In years past, I have received a dishwasher, vacuum cleaner, and you get the picture. So far, he has refrained from the annual septic tank pumping as a reward for motherhood, but there's always next year. While I may have a gratitude deficiency, Husband definitely has tunnel vision for what he wants. For Father's Day, one half of his present is the Cub Cadet; the other half will probably be something expensive that, coincidentally, fits my ring finger. Before you go getting critical, just remember: one Christmas he gave me a drill. * For the record, CB Mother is talking about a tractor that tried to kill her, a tractor which turned on her. She is not talking about a tractor which turns its owners on. If she were talking about that she just might be referencing CB Father who to the best of our knowledge has been riding that Cub Cadet since the day he brought it home. This is but one example of the many faces of a lady known as Mrs. Sunrise, whose beautiful and varied light greets me each morning. Except when it's raining. Or cloudy. Or if I get up too late. Or good lawd claude will someone shut her up? Lady and Gentleman! Step right up! Welcome to another edition of Three Ring Circus Three Thing Thursday, where we share three random thoughts. For best results, skip my three things--unless you want to be induced to sleep-- and go directly to the comments section, where your three things will gladly be accepted. 1. Although normally I type about 100 words per minute, tonight my fingers are so numb from the cold I can barely depress the keys; it's as if they've been injected with Novocaine that is only just starting to wearing off. Because after waking up at 5:30, fixing breakfast for two children, calling mother to finish the morning bus routine/send off, yea though I drove 50 miles through the valley of the shadow of death to be at my paying job by 7:30, working 8.5 hours, then driving another 50 miles home--after all this, Chesapeake Bay Daughter wanted to go to the Little League field to watch her friend play softball. All I wanted to do was blog decompress, but not wanting to stifle any interest she may possibly have in softball we went. Fine. As we stood against the fence for seven thousand hundred million innings, the sun went down and snatched away every shred of heat. She had to stay until the bitter cold end. Did I mention my fingers are numb? 2. This one's a confession: Not having to write anything for the past three nights has been wonderful. Although the intention was to use my newly found spare time to stockpile a few posts so each night wouldn't be spent scrambling at the last minute to create something, I crawled into bed with the clicker instead. Quickly overcoming any feelings of guilt, I discovered that I owned a television, which lured me to a new addiction: House Hunters International. Did you know there are people rich enough to have not just one house, but a second vacation home in places like Costa Rica? Who knew? Chesapeake Bay Woman surely didn't. Then, realizing that she can not even afford a vacation, much less a vacation home abroad, Chesapeake Bay Woman jumped off the Gwynn's Island bridge. But because the bridge is about two inches above the water, the worst that happened was a nostril full of salt water before she swam to shore, where she cut her feet on oyster shells, sank knee-deep in black mud and was assaulted by fiddler crabs. The End. Kaboom! That's the sound of Chesapeake Bay Woman's brain exploding due to the unnecessary and excessive use of numbers, which are better left to analytical types who understand that Three Thing Thursday does not mean Take Three Days to Tell Three Days' Worth of Wandering Thoughts Thursday and who can succinctly, concisely say three things. Things. Three. Two. Four. Five. Anyway, one unsavory event involves a dentist. Another involves a bank. The other two belong in a separate blog entirely called, "Are You Kidding Me, Is This Really Happening?" Reality TV show producers could not possibly have fodder this ripe for the picking. Now, please tell me three things to take my mind off the post I just wrote the things I dread doing. This is a shot from the Sea Breeze, located on what is currently known as Gwynn's Island but which any day now could become an underwater cafe in Milford Haven based on what we've read the past several days. Below is the conclusion to Mathews Mountain Man's (MMM's) piece. There are a couple of other strange scenarios that I should have sense enough not to just have to share with you. In the beginning of this incessant rambling essay it was stated that Gwynn’s Island may disappear into a giant sink hole that is in the early stages of development at the intersection of Old Ferry Road and North and South Bay Haven. That’s right; you read it here first, although I’ve already said that it wasn’t my idea. This proposition is not as strange as it seems. Sinkholes develop in many ways, commonly forming in swamps or areas where “standing” or stagnant water is often found. Florida is littered with swamps and sinkholes; and, topographically Florida and Gwynn’s Island have a lot in common. Too bad the winter weather’s not the same. Anyway, my expert source, who, I assure you, believes in the validity of his own ideas, has observed that rainwater on Gwynn’s Island tends to collect around the post office, a central location that is at the corner of Old Ferry Road and the respective Bay Haven’s. If you need to see this for yourself, take a trip to Gwynn’s Island after a heavy rain. My source argues that this is the beginning of a sinkhole. Who’s to say he’s wrong? So, as the sands of Gwynn’s Island sift through some unseen hourglass my eternally optimistic source, and first-order relative, will take his stand square in the middle of the intersection next to the post office. He will wait, and wait, and wait, until he is sucked through the earth’s core with the last grain of Gwynn’s Island, only to appear on the other side of the world standing atop a beautiful mountain. If that happens, I think I’d like to go with him. I will relate the final story as it was told to me, but I make no claims regarding its authenticity, unless, of course, you choose to believe it. The final scenario by which Gwynn’s Island may be “lost” (this has nothing to do with a Darma time machine) is based on a little know $1,300,000 study conducted by the U.S. Coast Guard. In 1966, a well known scientist named Buddy Rowge, hypothesized that, due to the expansion properties of freezing water, every time Milford Haven freezes the Island is pushed farther away from the mainland. He further hypothesized that based on average annual freeze-thaw cycles the Island was moving away from the mainland by a ½ inch each year. Given that the expansion allowance engineered into the Gwynn’s Island Bridge was 4 inches, Rowge’s hypotheses were troubling. It was feared that if the Island moves beyond the 4 inch allowance someone will open the bridge and not be able to close it. Three years after Rowge proposed his thesis, the Mathews County Board of Supervisors asked the Coast Guard to conduct a study. After an exhaustive series of pre-freeze and post-thaw measurements, taken at ebb-tide and flood-tide, during waxing- and waning-moons, and a host of multivariate analyses of covariance accompanied by Newman-Keuls pair-wise comparisons, the U. S. government produced a 1600 page pork chop dooly verifying that every time Milford Haven froze over, Gwynn’s Island was pushed away from the mainland. The average annual rate of separation, however, was slightly higher than Rowge estimated. After the initial panic, a minor real estate boom and three months of heated debate in closed meetings of the Board of Supervisors, Rowge’s twelve year old daughter came forward with a solution. “Just leave the bridge closed whenever Milford Haven freezes over,” she said. “But, how do you know that will work,” asked one of the supervisors. “On page 1526,” she replied. Little Miss Rowge was an instant hero. She was given a key to the court house, free hot-dogs and fries for a year at a local diner and was awarded a full scholarship to the regional community college. And, to this day, when Milford Haven freezes over, the bridge remains closed, unless, of course, a boat needs to pass through. Okay, so the idea that Gwynn’s Island is going to be pushed away from the mainland by ice is a wee bit of a stretch, but it is slowly disappearing. If it happens fast, it’s every woman for herself (I know who reads this blog). Sell if you can, but you better look, with haste, for an alternative habitat. If it happens slowly, that’s a different story. Only those who hang around the Island for a few years at a time will see it happening. Currently, the only thing between Queens Creek (where I live) and the bay is Gwynn's Island, which plays a strong zone defense against oncoming nor' easters and provides a great buffer between horrific winds and death heavy storm damage. If the island is moving farther away from the mainland, perhaps the day is nigh when I will live bayfront instead of merely creekfront. With no island to buffer us, the first nor'easter that comes through we'll all be toast blown like tumbleweeds into the state of West Virginia. Thanks, Mathews Mountain Man, for contributing and giving my reader me a much-needed break. If anyone else with any ties to Mathews would like to contribute, please oh please oh please oh please oh please send me your stuff and I'll be crying tears of joy very happy to post it. Stay tuned for Three Ring Thing Thursday, headed your way real soon. Above is a view from my back yard after a recent storm. Below is the continuation of Mathews Mountain Man's view of how Gwynn's Island is doomed. Surprisingly, none of his theories make mention of ants, which are destined to play a starring role in the final chapter of my house on Queens Creek. "Some insist that climate change is due only to natural causes, while others believe that the excessive burning of fossil fuels and the continuing release of atmospheric contaminates are beckoning an Old Testament inspired inferno. Some even argue that man-made global warming added significant heat energy to Hurricane Katrina and her siblings, thus increasing the damage to the off-shore oil platforms and refineries responsible for the fossil-fuel derived heat energy in the first place (don’t mess with Mother Nature). A few fundamentalist folks might even agree that internal combustion is Hell fire. Many, however, think that climate change is attributable to both natural and human influence and they respectfully urge that we act more responsibly. Despite what anyone thinks about the cause, a year-to-year net temperature increase in the earth’s atmosphere (i.e., global warming) is undoubtedly causing ocean water levels to rise. Two major sources include the addition of water to the oceans from glacial ice melt and the expansion of water volume due to increasing ocean temperatures. Okay, but what does all this mumbo-jumbo mean for Gwynn’s Island? It likely means that Gwynn’s Island is doomed – one way or another. - According to Al “I won the Nobel Prize for inventing global warming” Gore’s data, sea-level will rise about 18 inches every 100 years, or 0.18 inches per year. - And, according to a USGS topographical map dated 2006, the highest point on Gwynn’s Island is 10 feet or 120 inches above sea level (in a tree maybe). That’s an Old Testament number manifest as unrelenting wrath in the form of locust, frogs and, yes, floods. And, with a little Michener-like wave action, Gwynn’s Island is likely to completely disappear on or before 2525 – a Zager and Evans like prediction. If you doubt that these musical one-trick-ponies were on to something, consider this: the Zager and Evan’s song “Exordium and Terminus,” commonly known as “In the year 2525”, was number 1 on the Billboard charts commencing 6 days after the 6th day of the 6th month in 1969. Go ahead, invert those 9’s. And, their song was number 1 for 6 weeks. Suddenly, New Point Comfort (i.e., light house) is looking like the Statue of Liberty as seen by the humans, Taylor and Nova, in Planet of the Apes - think about that the next time you’re riding a horse along the beach. Seriously, though, (I get wacky when I start crunching numbers) global warming is a threat, particularly to those who own homes along the Milford Haven side of the Island. The land on that side of the Island is barely above sea-level. As the Bay water’s rise those homeowners will be among the first to step out of their house and into the muck." Stay tuned for the conclusion of Gwynn's Island's Demise, coming tomorrow to a computer screen near you. The picture above was taken last summer off of Gwynn's Island, looking towards Deltaville. Oh, what I wouldn't give to be sitting at the end of that dock right now with no cares in the world. And no ants. Speaking of Gwynn's Island, I am pleased to share another piece written by Mathews Mountain Man (aka MMM in the comments section). Here he shares some theories on how and why Gwynn's Island is doomed. I figure there's no more appropriate topic to kick off the work week than with doom and gloom. But let me stop talking now so you can read some real writing and not rambling nonsense. "... if Mother Nature doesn’t wash her away in some turbulent frenzy, the steady rising tide of climate change will sink her, she will drift away (yeah, right), or, according to one seer she will disappear into a giant sink hole that is in the early stages of development at the intersection of Old Ferry Road and the Bay Haven Drives. Regardless of the method, Gwynn’s Island is doomed. In his book Chesapeake, Michener meticulously detailed the many overlapping cycles of life that characterize the Chesapeake Bay. The disappearance of Devon Island and Rosalind’s Revenge represented the end of one such cycle. Devon Island was located on the eastern side of the Bay. On calm days the island was persistently licked away by the Bay waters; when a hungry storm with a northwesterly wind drifted across the Bay, the shoreline was bitten away in chunks. Michener chronicled the consumption of the island, not in one paragraph, page or chapter, but bit by bit, throughout the entirety of the book – the first generation of characters did not know what the final generation would witness. ...On the spot where the finest mansion [Rosalind’s Revenge] on the Eastern Shore had offered its stately silhouette, nothing was visible. The final storm which overtakes all existence had struck: that relentless erosion which wears down even mountains had completed its work. Devon Island and all that pertained to it was gone. Michener got it right, and to apply his certitude to other islands in the Chesapeake is to know that Gwynn’s Island will one day disappear. My first observation of Mother Nature’s intentions for Gwynn’s Island occurred in 1969. The day after a fierce storm that swept over the island, several of my cousins and I walked south along the beach from Tin Can Alley. Before that day any healthy soul with mild ambition could walk the mile-and-a-half that led to the Hole-In-The-Wall; but, as we soon discovered, the storm that passed through only 24-hours earlier had washed out a small section of the peninsula. Everyone who wandered though the freshly cut, 20 foot wide, ankle-deep channel saw that Gwynn’s Island’s right leg had been severed from her body; and, each one of us has lived to see that that thin film of water passing out of Milford Haven and into the Bay has become a navigable waterway – 1000 feet across. Other examples include the waters flowing in and out of Hill’s Bay that threaten to cut-off the island’s other leg. Those waters splash and spray against the fragile highway that squeezes through a narrow strip of land along the Island’s western shore. And, there are the large chunks of land and land-hugging trees that are reclaimed when a hurricane or nor’easter rolls up the Bay. Slowly, but persistently battered and bruised by Mother Nature, Gwynn’s Island has become much smaller than the island I explored as a child. It’s only a matter of time before she succumbs to another fury of wind and water, unless of course a flood doesn’t creep up and sink her first." Stay tuned for the other Gwynn's Island Doomsday scenarios coming your way later this week. Gwynn's Island is on the list of sites we will be visiting during Blog Fest. Hopefully it will not have drifted away, sunk or succombed to a giant sink hole before then. Recently the weather has been indecisive, which isn't necessarily a bad thing. ...and so does our creek sometimes at sunrise. This is a different perspective from the same morning captured in yesterday's photo. The rising sun quickly chases away the lingering morning mist as if it were an unwelcome trespasser. Things change so quickly that sometimes by the time I find my camera (which is usually right under my feet), it's too late to capture the moment. Here's to taking the time to not only capture--but appreciate and savor--the moment. p.s. Here's also to a good night's sleep, no work and hopefully no drama on Saturday. If there is drama on Saturday (ordinarily my favorite day of the week) I'm going to have to exchange it for a refund. Saturday came with a guarantee when I signed the dotted line acknowledging it to be the best. p.p.s. Chesapeake Bay Woman's past two days could overflow and clog up a screenplay writer's toilet C: drive. Or A: drive. Or Wang word-processor. Welcome to another recent sunrise over Queens Creek and another edition of Factual Friday, where I try to convey actual facts rather than opinions, hot air, vague statements, run-on sentences, rambling thoughts and ridiculous fluff. "....Some of the early land grants were Hesse, about 1643; Old Field Point, 1653; and Poplar Grove, about 1750. The tide mill at Poplar Grove was patterned after its forerunners used in London. It ground corn on both the incoming and outgoing tides. During the Revolutionary War, meal was furnished to Washington's troops at Yorktown from this mill, which ground about 32 bushels of meal on a tide. The mill was burned during the Civil War but was rebuilt and used until 1912. The building, much of the water wheel, and the mechanism are still in place. In colonial days silk was produced by silkworms imported from Italy. The silkworms fed on mulberry trees. John Clayton, a famous English botanist, lived at Windsor in the western part of Mathews County. Here he established a botanical garden. Before 1700, tobacco fields began to wear out. These fields were then used to grow wheat and corn. Some old fields were fenced, and cattle grazed in them instead of in wooded pastures. More emphasis was given to the raising of sheep and hogs, and the acreage in corn was increased to provide additional feed. The soil was fertilized by the Indians and the early settlers by placing fish in the hills of corn. Early in the 1800's, guano was imported from the West Indies for use as fertilizer. In 1832 a small amount of guano was brought from Peru, and it proved to be highly successful....."
So it appears that today's factual post will end on the topic of guano, which is no different than any other post you'll read here, factual or otherwise. Welcome to Three Thing Thursday, where I write three random things and with any luck you write three random things. Please write something, I love reading your comments. How this is different from any other day where all my uncensored thoughts come out is that there's a self-imposed limit to the insanity randomness. However if anyone out there wants to exceed that limit, please help yourself. 1. My work schedule changed this week, which interrupted my nap schedule normal routine. Ordinarily today and tomorrow are my days off, yet as we speak I am sitting at work crying listening to someone drone on talk about retirement plans. If they were talking about my retirement, I’d be sobbing tears of joy and would buy all of my two readers a present. 2. In anticipation of this schedule change, I decided to do some cooking today so that tonight and tomorrow’s dinner would not involve screaming, hollering, frustration and Rolaids a whole lot of preparation. Chesapeake Bay Son recently proclaimed to the world that egg salad is now high on his list of preferred foods, so I decided to make a batch. Have I mentioned I’ve never made hard boiled eggs before? Oh. Well anyway I found an egg salad recipe and followed the boiling instructions to the letter. Evidently, though, my definition of a gentle rolling boil is different from the recipe author's definition. My definition results in soft-boiled eggs--another thing I've never made! The recipe author must have a whole lot of patience. Also, soft-boiled eggs are not listed as an ingredient in egg salad, or any other recipe for that matter, fyi. 3. Last night Chesapeake Bay Son announced that there were ants in the upstairs bathroom. I never go upstairs because what I can’t see will not hurt me. Armed with super-industrial-strength Hot Shot, he hardly put a dent in the ant colony which has taken up residence inside our house took care of the situation. Today I discovered the ants are everywhere up to and including in my closet, behind the television set, crawling up my arms and lying in a supine position across my bed. They’ve surrounded the house and grouped themselves into armies, each one with a different plan of attack. Calgon take me away. Serenity now. Your turn. Three random things. See those two trees dancing on the right? That pair has been together for years. Their very first dancing lessons coincided with several days of a strong, persistent nor'easterly wind. Although timid at first, they became more confident and learned to bend and be flexible after each storm. She took to it quicker than he did, but both moved whether they wanted to or not. The more of those nor'easter dances they attended, the more limber they became. Sometimes--especially now that they're older--they dance as if they're the only ones around. Most nights, though, they dance with the stars. p.s. This is Chesapeake Bay Woman playing her own game of Interpret that Photograph. Here in Mathews, we learn at a young age to entertain ourselves with almost nothing. If you have any deep thoughts, ideas or statements that come to mind after looking at this picture, please tell me. Unrelated ones are also welcomed, encouraged and understood. This was taken at Aaron's Beach that day I was caught behind a senior citizen driver and missed the most spectacular sunrise sky ever. Madder than a wet hen, I pointed the camera directly into the sun which goes against every rule ever spread as propaganda in most photography manuals. Speaking of going against rules, let's talk about my gardening skills. This will not take long. In fact, we're practically done. It's time for another chapter in the Chesapeake Bay Woman's Home and Garden series. Today we're going to review one way the best way to plant a garden if by "garden" you mean "produce section of the grocery store in lieu of garden". Let's start by taking a quick quiz to assess where we stand in our gardening capabilities. 2. The first step is to prepare the soil which entails what? b) Insert sounds of crickets chirping and dogs howling here. Then insert a picture of CBW shrugging her shoulders as she twists her mouth and rolls her eyes. See, she's never planted a garden before. c) Preparing the soil. Whatever that entails. It's also helpful if you select a spot to plant this garden even prior to preparing the soil. But of course I don't need to tell you this. 3. Since it's too late to start plants from seeds--notwithstanding your lack of skills to start anything from seed--travel to a nursery and peruse the selection of vegetable plants. a) Wake up on a Saturday. Drink coffee. Check blog. Drink coffee. Check blog. Drink coffee. Caffeinate self enough to become motivated to drive to Tatterson's Greenhouse in Port Haywood. Just to look. For best results, do not plan anything up to and including where your garden will be and what sorts of plants might do well in your chosen spot. b) Wander around aimlessly. After figuring out which plants are for flower beds and which are for vegetable gardens, take a break and come back later because by the time you've figured this out the nursery is shutting down for the day. c) Spend some time contemplating which type and how many plants you want. You might consider where you'll plant these prior to the trip to the nursery, but planning things out to that level of detail is not in your vernacular something you can strive for next year. 4. After you've purchased what you consider to be an appropriate number of plants for the garden you've really not even designated yet, what happens? a) You realize you have to pick a spot and pull weeds. Just thinking about this brings droplets of sweat to your forehead and you feel that it's becoming harder to breathe. Take a break, there's no need to over do it now, is there? b) Begin pulling some weeds. After two or three tugs at the devil known as crab grass, break into a sweat resembling Niagara Falls. Realize you don't have the patience or stamina for this sort of work. Take a break to review where you stand. And who you can call. c) Realize you've purchased way too many plants and you do not have the patience to plant any of them, much less pull the crab grass. Besides it's way too hot and tomorrow's Mother's Day. Which makes this Mother's Day Eve. Which is practically Mother's Day for goodness sakes. Take a break. 5. After you realize you have no idea what you're doing or why you thought for one minute you could do this perhaps bitten off more than you can chew, what now? a) Take a break on the back porch in the shade as the breeze blows across your sweaty brow. Close your eyes and reflect on the situation. Marvel at the symphony of birds. Breathe in the scent of the nearby rose bush. b) Take a nap. Wonder what you're going to do about all this. Wonder for only five seconds. Nap for an hour. c) Realize tomorrow's Mother's Day and you've not purchased anything for your mother since you were too busy with this gardening nonsense. d) Give plants to mother who has two green thumbs. e) Eagerly await the 62 different varieties never mind how many individual plants ruby red tomatoes and the jalapeno, poblano, sweet banana and chili peppers which will be taking over our lives kitchens. Consider that you may want to research storage techniques such as canning. f) Make note to self that Chesapeake Bay Mother not only needs to plant and maintain these vegetables, but she'll need some Mason jars for canning. This is from Commenter Breezeway's lovely Gwynn's Island cottage a few weeks back. After reading about a typical Chesapeake Bay Woman weekend, you'll understand why I return time and again to these tranquil scenes. They're very therapeutic. For Mother's Day, Chesapeake Bay Daughter colored me an incredibly beautiful card, and Chesapeake Bay Son created a high-tech card using photos taken from his DSi-SomethingSomething and the computer. Both cards warmed my heart, but Chesapeake Bay Son's struck a particular chord because it provides a tiny glimpse into the insanity daily trials and tribulations we deal with around here. Below is the dissection of his card, where I share a statement he makes followed by my explanation of the event. Best of luck trying to keep up. If you're sleepy you may wish to lay your head down and take a brief nap. This whole thing will be over before you start begging for mercy know it. For everyone else, here we go. Let's hope that none of these daily events occur on Mother's Day! 1. Sick cat makes you have to drive out of county while mother further frustrates you. On Thursday, our favorite cat became ill. CBW said, "Oh, he'll be OK." CB Son could see otherwise and went next door to get my mother, who promptly declared that the cat was going to die immediately if not yesterday if we didn't get him to a vet. The only problem? All the vets were kicked back enjoying Dancing with the Stars closed for the night, but Dr. Skinner in Hartfield agreed to meet us in his Middlesex office about 15 minutes away. The drama, the frantic instructions, the sniping involved with contacting a non-Dancing-With-Stars-watching an after-hours vet who wasn't 3 states away, packing a very sick cat into a clothes basket, listening to him howl all the way there while trying to block out the sounds of my mother describing in painful detail how the cat was going to die (in front of howling cat, CB Daughter and CB Son, all of whom were blinking back tears, especially me the cat) was definitely frustrating, and this is but a brief version of the story. The cat is recovering nicely; the verdict on my status has not been reached. 2. Father rides around on 3-wheeled contraption and decides to start a very stressful fire that might burn down the yard. But it's okay, he used diesel to light it not gasoline. Not too long ago, the Chesapeake Bay Children and I were enjoying a quiet moment on the back patio as the sun went down. Before you could say, "Smokey Bear might have something to say about this potential wildfire," the entire yard was up in flames as my father torched a burn pile. He explained that it was not dangerous due to the use of diesel fuel vs. gasoline. Evidently diesel fuel is safer than gasoline as an ignitor. While this may well be true, the mere fact that my eyebrows were singed and I was a mile away there was discussion about which flammable substance was being used to stoke flames resembling the Great Chicago Fire really seemed irrelevant to the overall point which was this: THE ENTIRE BACK YARD IS ON FIRE. 3. Mutant infestation of moths/ants taints the food supply and causes screaming that can be heard a mile away. We hope that none of this happens on your day off, Mom! If anyone has any doubt that on a daily--if not hourly--basis I scream due to an infestation of one sort of another, please believe Chesapeake Bay Son. We have mutant infestations which taint the food supply. With apologies for the poor quality due to the fact that the original has faded, here is a picture of my mother right after a year of college at William and Mary. She had to quit because her mother was working a menial job and money was scarce. So she found a job at the Naval Weapons Station in Yorktown. There some young photographer asked her to pose for him down on the beach, and thank goodness he did. We have about 10 pictures like this and they're all fabulous. In honor of Mother's Day I'd like to share an entry from Chesapeake Bay Middle Sister's diary because it mentions a few things which are appropriate. This is the first thing I've written you for 2 years. Just think, 5 years ago I wrote my first entry. Well, today CB Older Sis and I went to see Nanny. We ate fried chicken and all sorts of good stuff. When we got back we all went to softball practice. We scrimmaged Ebenezer. We lost 11-12. It was close. We goofed off. Our best players weren't here. I pitched (ta-dum!!). Nanny was our mother's mother and is someone I think of and miss every single day. She made the best fried chicken you've ever put in your mouth and could whip up a feast out of nothing at all. As one of the first females at Gloucester High School to receive a varsity letter in basketball, our mother was an incredible athlete and encouraged us to be active. Even after having three children, she played softball in the county league and made sure Middle Sis and I played on the team too. (Baby Sis was too young at the time.) I loved those games and to this day marvel at how well CB Mother could throw, hit and field the ball. -CB Mother's Mother was one of my favorite human beings ever. -CB Mother is beautiful inside and out. -I'm so grateful for her encouragement to play sports. Practically all of my fondest memories from my teenage years revolve around a sport of some sort. -I'm grateful to her for all the sacrifices she made. -I'm fortunate to have her right next door whenever I need her. Left to right: Chesapeake Bay Father; Chesapeake Bay Mother; Chesapeake Bay Toddler, circa 1966, right after electricity was invented. This is a picture of a picture because that's how high tech I am. No, I did not scan this--that would mean overcoming my fear of instruction manuals and the whole electronics industry. This is a digital image of the original framed picture. Boy am I ridiculously inept innovative! Our mother is a beautiful lady, although you can't tell her that. (Maybe she'd listen to y'all, but it falls on deaf ears if we say anything to her.) Of course she looks a lot different than she did 40+ years ago, but she's still pretty, inside and out. Tomorrow I'll post another unbelievably bad attempt example of my technical genius--another picture of CB Mamma in her earlier years. We've had so much rain here lately that I want to scream sometimes we overlook the fact that even in twenty two hundred consecutive days of dark rain trying times there is hope and a reason to keep looking past the darkness. You never know what you'll find. What you do find may be the very explanation for the darkness. In the meantime, if you double click the image above, you can see what I'm talking about. In other news, it's Friday. What plans do you have for the weekend? Please let me read what people who do not live in a state called Drama are doing to exist have fun. Here are two sailboats around Stingray Point. Three would have been perfect for today, but imperfection is the new perfection. Three Thing Thursday is where I tell you three random things and you tell me three random things--anything you want. A friend recently suggested I call this Three Ring Thursday, which is quite appropriate since my life does resemble a circus every single most days. 1. The other day Chesapeake Bay Mother was pacing nervously back and forth along her shoreline. Come to find out her goose, Gustav, was swimming too far down (really up) the creek with his Canadian friends. As no one might expect, she got in the car, spun out on two wheels, drove down the highway which runs parallel to the creek, turned into some absolute stranger's driveway and trespassed right on across their yard as she hollered for the goose to get on home. He did. 2. Time is flying by at an alarming pace. Yesterday it was Christmas, and tomorrow it's practically Memorial Day. When did that happen? If I don't start doing the things I really want to do with my life and my children, it's going to be too late. At this rate, when I wake up tomorrow the kids will be grown and gone. Pushed in some obscure corner of the nursing home, I'll be drooling and slumped over--and that's if I'm lucky. 3. What are the things I really want to do before it's too late? What are the things you really want to do? Mine include things like taking the Chesapeake Bay Children to see (and hike) the Grand Canyon, Teton National Park and Glacier National Park. For myselfish, an Alaskan cruise, eating Vietnamese food just one more time, and documenting all our family and local history before it's gone forever. A glimpse of Bora Bora in person would be grand. World peace is sprawled out all over my list but assumed to be impossible in my lifetime. Still, a person can dream can't she? Please tell me three random things or three things you'd really like to do before you're not able to do them, for whatever reason. p.s. If anyone out there is saying, "CBW is having a mid-life crisis," I'd say they were right except she's been having this crisis since the age of 10 so it's really nothing new. What has changed is the pace at which time is flying by and the realization that we are but a drop of sand in a sea of desert at the mercy and whim of an invisible wind. Here is Satan Gustav, my mother's goose who was named by an anonymous reader in our Name That Goose Contest a while back. Welcome to a rare sight on this blog: a post that contains no rambling sentences, simple vocabulary or scattered thoughts. We owe this miracle to Chesapeake Bay Mother who has written an update on the beast goose. It's just my way of giving us all a break from the inane commentary that usually spews forth from this site. Gustav is currently building bridges to friendship with a few wild geese who visit him. He can be seen socializing and taking swims with them. He also becomes fiercely protective of them and practices his version of "shock and awe" on Husband, who is otherwise widely liked. It is getting routine now, the responsibility falling to me to separate man from goose. I look forward to a visit from Husband's brother, who is also not a big goose fan. It could work out to be a stampede of big, fearful men that I must manage. My dogs barked to welcome Brother-in-Law on his last visit as we all came indoors, and he abruptly backed up without warning causing a three-stooge pile-up and worked over my size 9's with his at least size 13's. Lesson: Never, ever startle a brain surgeon. They have remarkable reflexes. All that won't help him with Gustav, who is only spurred on by hasty, guilt-displaying retreats. His reasoning: If you aren't up to no good, why are you fleeing? *If you saw your mother chasing a goose around the yard hollering, "Here Gootie! Here Gootie!" loud enough for folks in three counties to hear it, you might not exactly find favor with the name either. She has a rather long track record of bizarre pet names which always made me blush and/or cringe whenever she had to provide a name to the vet, for example. Imagine the attendant coming out to the waiting room and calling, "Big Kitty? Is Big Kitty ready to see Dr. Richards?" Or what about Mummanator, an unspayed female who produced four thousand a number of litters before she was spayed. Little Latin Leo from Rio (a son of the Mummanator) is anything but little, approaching the size of a small pony--evidently a Latin pony with a show name. The list of unusual monikers goes on and on. **My grandfather Gustave was a West Point grad and a brigadier general who helped construct a pipeline from Somewhere to Somewhere in one of the world wars, details I cannot remember although I do remember how long his white eyebrows were and how I wondered why he never trimmed them even though they stretched out like awnings over his eyes, but perhaps they served a purpose or perhaps he was being rebellious after all those years of close-cropped hair in the Army and I THOUGHT we were taking a break from my babbling? This is the one millionth yet another picture from Aaron's Beach on the one day this year it didn't rain. Off in the distance, the Chesapeake Bay Children are scouring the beach for sea glass and driftwood. Today's post will be mercifully brief because as I write this Monday evening we're under a tornado/severe thunderstorm watch or warning. (Whichever one is less imminent. Except when everyone at work and every person on the radio is talking about it, what's the difference? It's as good as imminent; we're about to be blown away.) I want to quickly queue up a post in case we lose power. Thursday: Brief one-hour respite followed by a whole new system which will bring--you guessed it--rain. Friday: Chesapeake Bay Woman performs a swan dive off the tallest building in Mathews, which she believes might be the old Fosters Department store, and even if it isn't that's where she's going to perform this feat because it's right across from the old Sibley's General Store which is now the Visitor Center and what better way to welcome tourists to the county than to afford them the opportunity to see how crazy in tune the citizens of Mathews are with Nature. Our moods are intricately tied to the changes in tides, phases of the moon, sunlight deprivation, and what's on sale at Food Lion and Best Value. Saturday: Chesapeake Bay Woman reviews plans for an ark, preferably one with a crew of two chefs, two maids, two exterminators, and no ants. At least one of the exterminators looks like Harry Connick, Jr.
Sunday: The ark will land atop Zooms Convenience Store in Hudgins where Chesapeake Bay Woman will discover she has won the lottery and can move to Bora Bora where she'll promptly be swept away by a tsunami, because that's just her luck. p.s. I'm no longer worried about the tornado thing as it appears to be blowing over (no pun intended), but I am very concerned about acquiring those two exterminators. If the rain doesn't do me in, the ants most certainly will. Congratulations to TSAnnie, who wins the Name That Photograph Contest from Friday. Warning! What follows is a rambling, wordy, over analyzed, excruciating description of my decision-making process. You may wish to exit this blog right now or risk beating your head up against a wall about three sentences from now. First, thank you all for participating in that contest. There were many I loved and a few I really loved. For example, Bayman's "The Trojan Sponge"--which referred to fiddler crabs being carried in stealth mode onto the beach--had me in absolute hysterics right off the bat. Anonymous's "Logfest" also made me laugh. The more entries I read, the more I loved, and the more difficult it was for me to decide. When I read TSAnnie's entry, I furrowed my brow and said to myself, "Self? I know at a high level what this word means, but could there be a deeper meaning, could there be more to it?" "...Stoicism teaches the development of self-control and fortitude as a means of overcoming destructive emotions; the philosophy holds that becoming a clear and unbiased thinker allows one to understand the universal reason. A primary aspect of Stoicism involves improving the individual’s ethical and moral well-being: "Virtue consists in a will which is in agreement with Nature." This principle also applies to the realm of interpersonal relationships; "to be free from anger, envy, and jealousy", and to accept even slaves as "equals of other men, because all alike are sons of God." When I read those words, I became overwhelmed with emotions and actually drafted up an e-mail to send to TSAnnie. Those words have significant meaning to me. But after I drafted up the e-mail, I didn't send it for reasons I cannot explain. Next, after all this and still unable to make a decision, I wrote down all the entries and then let the Random Number Generator (random.org) pick the winner. TSAnnie's was the 13th one I wrote down, and 13 was the winning number. Since I had spent so much time reading deeper meaning into the word "stoic" than she probably intended and because Random Generator also picked her, TSAnnie wins. Even I am exhausted trying to explain the inner workings of my decision. Please come back tomorrow when things should be more coherent, but don't be surprised if they aren't. One morning last week as I was leaving the house, the sky told me she really wanted to be photographed from Aaron's Beach. Being the cooperative sort, off I went. Because an old lady who could barely see above the steering wheel was going thirteen excruciating miles per hour in front of me, Due to unforeseen events, the particular sky I wanted to photograph had changed drastically and the sun was too high in the sky by the time I arrived. Aaron's Beach and my house are some distance apart, even as the crow flies. Ordinarily I'd never point the camera directly into bright sunshine but not wanting to waste the gas opportunity, I grew a wild hair and did it anyway. The results were better than I expected and are some of my favorites. Later in the week I'll share some more of them. Stay tuned for the announcement of the Name That Photograph Contest winner. I can't make up my mind will let you know as soon as possible. Although I told myself and my one reader there would be no new post until later today, here we have one. Blog addiction and compulsive posting are symptoms of a very serious condition known as Exactly What Chesapeake Bay Woman Suffers From. There is no known cure. It's not too late to enter yesterday's Name That Photo Contest. I'll be mulling over the titles tonight and tomorrow and will announce a winner soon. Lastly, this is a recent sunrise over Queens Creek. Here lately the sunrises have been nothing short of spectacular, but there's only a brief opportunity to catch the best shots because things change so quickly. This picture does not do the sky justice and the lighting is poor, but I'm putting it up anyway because it's the only picture I have uploaded and I must feed my need to post this sky is a prelude to one I'll be showing tomorrow for Silent Sunday. I hope you have a peaceful, fun, relaxing, enjoyable, All Things Good Saturday. In my opinion one of the best bloggers out there is The Pioneer Woman, who is a city girl transplanted to a ranch in the middle of Nowhere, Oklahoma. Although I rarely visit any more because I don't have the time, she used to (and probably still does) run contests where she asked readers to provide a name for the particular photograph she selected. This is a similar contest. The picture above is from Aaron's Beach, and for reasons that cannot be explained it is cockeyed. Yes, I have an automatic stabilizer on my camera. Yes, if you discount the bottom half of the picture, the horizon appears almost in line but only when you close one eye and stand on your head. But there's simply no disputing that the picture is crooked. If this photograph were to be framed and displayed in an art show, what name would you give it? Rather than interpreting the photograph or describing what you see, can you pick a few brief words that would be the title for this incredibly bad entry in the Art Show for the Afflicted? Sands of Time? Slipping Sideways? Slippery Slope? Chesapeake Bay Woman's Off- Kilter Point of View? Your answer can be humorous, serious, ridiculous or superfluous. Also, this is not the greatest photo to select a name for--in future contests they will be more interesting. Just do the best you can with what is here. I'm not big on rules and am known to either forget them or change them. So go ahead and enter as often as you like unless you're a spammer, in which case disregard this sentence. I hate deadlines, but let's just say you have until late afternoon on Saturday to enter unless you hear otherwise. There's a very good chance I will not set up my regularly scheduled 12:01 a.m. post tonight and will keep this up until tomorrow afternoon to give me time to reacquaint myself with my children since all I do is blog see what we get in the way of comments. The winner will have his or her choice of one of the following hardback books, all of which are like new and most of which have never been cracked open once. 1. The Cabin by Mulfinger & Davis. This is a gorgeous coffee table type book that shows all sorts of cabins in very beautiful settings. At one time my dream was to build a cabin somewhere. Now I just dream for a few consecutive days of sleep locked up in a hotel room away from all of life's responsibilities. Anyway, this is a gorgeous book, I love it. I might enter my own contest just to keep it. 2. Wine, An Introduction, by Joanna Simon. The folks who regularly comment here will have no use for this book other than as a coaster, but perhaps there is someone out there who would enjoy learning the ins and outs of wine--how it's made, the different types of grapes, etc. It's another good coffee table book. 3. Homer's Iliad. Brand spanking new. 4. High Tide at Gettysburg by Glenn Tucker. Brand new, somebody left it here, know nothing about it, assume it's more about Gettysburg and less about the tide. Thanks for reading and participating. Have a wonderful weekend.